Furnishing your outdoor area? Get to know five worthy wood species before you build or buy beautiful, durable pieces for your patio, deck, and lawn. Q: I love the warm look of wood for outdoor furniture, but I’m not sure which of the many species will look and perform best out on my patio. How can I pick the right one? A: Whether you plan to build your own Adirondack chairs or purchase a pre-built picnic table, you’ll certainly want something hardy. 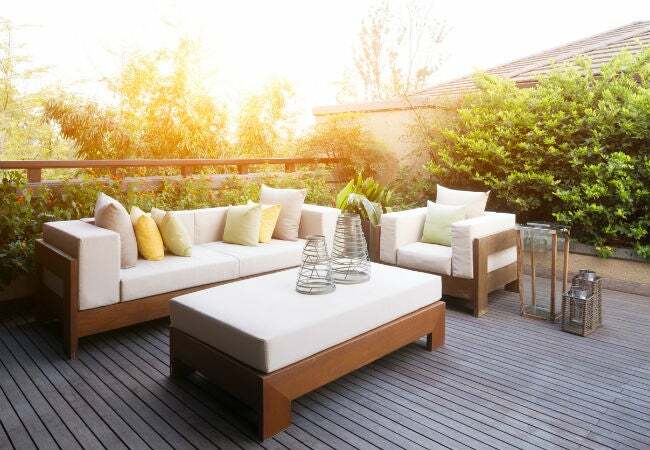 Furniture that lives outdoors must take a beating from heat, cold, and rain and also be able to withstand rot and pests. So you’ll want to consider where a species falls on the Janka hardness scale, which is measured in pounds-force, abbreviated as lb f. (Australian buloke, arguably the hardest wood, rates a 5,060 lb f.) In addition to durability, factor in looks, colorfastness, and price, as well as workability and finishing requirements if you’re doing a do-it-yourself project. Read on for our top five picks for the best wood for outdoor furniture—and the strengths and weaknesses of each. Acacia is cheap and rugged but prone to rotting on wet ground. The abundance of acacia trees worldwide means it can be had for between $2 to $6 per 12”x12”x1” board (known as a board foot) and enjoyed for its light brown to reddish brown hue and interlocking or curved grain pattern. Ranging from 1,100 lb f (Acacia mangium) to 4,270 lb f (Acacia cambagei) on the Janka scale, this hardwood naturally resists scratches, dents, and gouges, but DIYers should be aware that it can also blunt the blade of tools such as hand saws or chisels. The species easily holds together with screws/nails or glue, but interlocking grain patterns take considerable elbow grease to sand smooth. Thanks to its high oil content, when annually sealed with a clear protective coat (such as TriCoPolymer Lumber-Seal, available on Amazon), acacia handily wards off insects, moisture, warping, and rot, and can retain its color even with prolonged sun exposure. Unsealed acacia, however, is likely to rot and fade from moisture and direct sun, so it should be parked off the grass and in the shade. Black locust offers superior weather resistance but is difficult to saw and varnish. Scratches, dents, and gouges are unlikely to show up on this rugged hardwood that measures 1,700 lb f on the Janka scale. Black locust is more labor-intensive to hand- and machine-cut than cypress, redwood, and cedar, so it might not the best wood for outdoor furniture that you plan to build yourself. It’s so rigid, in fact, that repeatedly hacking with a hand saw or chisel can dull blades—if you do intend to build with it, cut carefully and conservatively to spare your tools. The pale green to dark brown, straight-grained wood, which runs $1.50 to $5 per board foot, can be sanded with little risk of over-planing and easily assembled with screws or glue. Thanks to flavonoids in the heartwood (inner wood), black locust furniture can weather extreme heat and cold, water, fungus, and termite and carpenter ant infestations, even if you don’t stain or paint it. While the tight wood grain generally keeps it from absorbing most stains, oils, and other finishes, this can limit your ability to stain it and also expose the furniture to UV-related color fading. Cypress is easy to work with but take care not to over-sand. Available for $4 to $6 per board foot (pricey, due to the limited supply of mature trees), cypress is coveted for its golden brown to reddish brown hue, knot-free straight grain, and high resistance to rain, rot, warping, and pests, thanks to a natural inherent preservative oil called cypressane. As a softwood measuring from 430 lb f (Leyland cypress) to 1,360 lb f (Australian cypress) on the Janka scale, cypress can easily be cut and assembled with screws/nails or glue. It’s susceptible to denting or over-sanding, however, so in addition to taking a light touch, woodworkers are advised to pre-drill any holes needed at the edges of boards to help keep them from splitting during assembly. 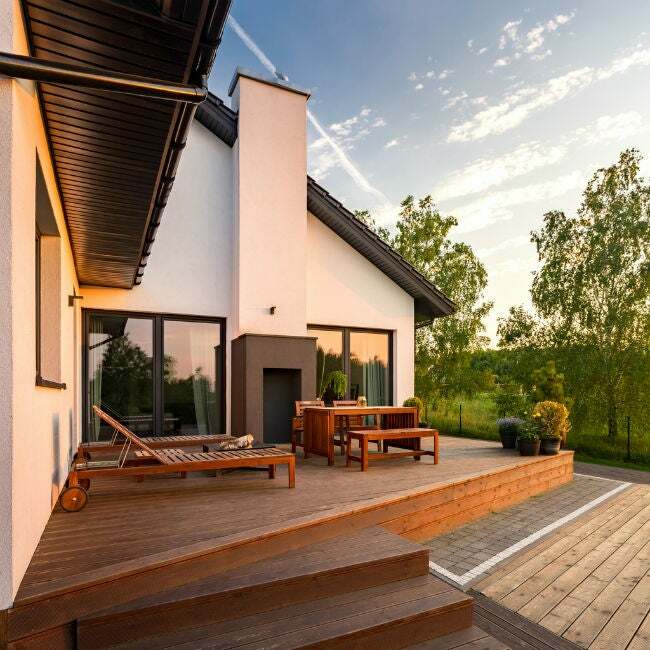 Finishing cypress with an oil-based, mildew-resistant stain can make its lighter shade pop, but you’ll want to top the stain with a clear protective sealer annually to prevent color fading from prolonged sun exposure. Cedar fades beautifully but is easy to ding or dent. Sold for $2.25 to $6 per board foot, cedar boasts an amber to rich brown hue and a straight, occasional knotty, grain. It’s a lightweight softwood with a Janka rating of between 320 lb f (Northern white cedar) to 900 lb f (Eastern red cedar) that’s a pleasure to cut, and the resins in cedar lend furnishings a pleasant aroma and excellent resistance to moisture, rot, termites, and powder beetles, even without stain or paint. Cedar’s supple quality, however, makes it vulnerable to dents and dings, and it has weaker screw-holding properties than acacia or black locust. The tannins in cedar can also bleed into top coats, so you’ll need to thoroughly dry and then apply an oil-based stain-blocking primer to the wood before painting. Although unfinished cedar fades with sun exposure, it will attain an attractive subtle gray hue over time. 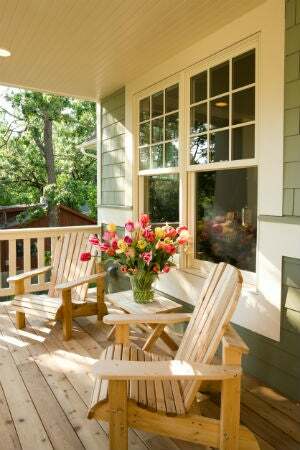 By staining or painting cedar furniture, and then regularly treating it with a clear protective sealer whenever water starts to penetrate the surface, you can boost rot repellent properties and minimize color fading. Redwood has the most vibrant look for the highest price. At $2.25 to $10 per board foot, redwood is pricey due to the short supply of these majestic trees. It’s highly desirable nonetheless for its light pink to deep reddish brown hue and straight to irregular grain—traits that make redwood ideal for live edge furniture, which highlights knots and other flaws. Looks aside, redwood is resistant to shrinking and warping in the face of heat or moisture and can moderately stave off rot and pests. Although the softwood’s Janka rating of 450 lb f makes it less effective at holding screws/nails in place, and more prone to scratches and dents, than stiffer woods like acacia or black locust, it’s generally easier to hand- or machine-cut and sand, and holds together well with glue. As with cedar, tannins from redwood are prone to bleeding into top coats, so be sure to prime the wood with an oil-based stain-blocking primer prior to painting, and regularly treat it with a clear protective sealer to ensure a stain-free, colorfast finish.